This is an absolute rarity! 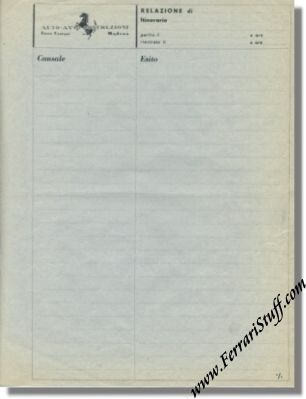 This is an original 1940 - 1947 worksheet from "Auto Avio Costruzzioni, Enzo Ferrari, Modena". When Enzo Ferrari left Alfa Romeo, he had to sign a clause which forbid him to be active in motor racing under his own name. Since Enzo still wanted to follow his passion, he founded Auto Avio Costruzzioni or AAC which in 1947, after the clause had ended, would form the basis of the modern Ferrari company as we still know it today. Very thin gauge blue-ish paper with printed AAC logo complete with prancing horse in the left top corner. Header in the top right corner and two columns on the rest of the page headed "Causale" (Cause) and "Esito" (Outcome). Good condition for age but does show a degree of yellowing due to age on the borders and minor fraying at the edges. When was the last time you saw one of these for sale? Guaranteed to be an original. It measures approximately 9 x 11 inches.